A meatless Canada? Not quite, yet. Canadians love meat. Many of us have been dedicated to our favourite protein source for years. But other sources of protein are emerging as potent alternatives to animal protein. Demand is up for vegetable proteins like pulses, as well as for fish and seafood, Loblaw has even started selling cricket flour and is trying to make insect consumption mainstream. As a result, some believe vegetarianism and veganism may be on the rise in Canada. Not so much, it seems. 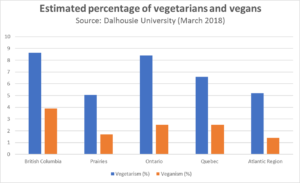 According to a recent poll conducted by Dalhousie University, it appears that the number of vegetarians and vegans have remained the same, but the number of Canadians who follow specific dietary practices is clearly on the rise. Results suggest that 7.1% of Canadians consider themselves vegetarians, and 2.3% vegans. These numbers are fairly consistent with several other polls conducted over the last decade or so. Vegetarians maintain a meat-free diet, while vegans also abstain from any animal or animal-derived products, including dairy, eggs, and even honey. We should note that there are several variations of vegetarianism and veganism. But even if these percentages are not shockingly high, we are getting some indication that things may get more complicated in the future. Results show that 32% of Canadians do observe some sort of committed dietary regime. This number is one of the highest we have seen in recent years. Women are 0.6 times more likely to consider themselves vegetarian or vegan than men. Level of education also seems to be a significant determinant. People with an university degree are three times more likely to consider themselves vegetarians or vegans than those with a high school diploma. Consumers living in British Columbia are 0.6 times more likely to identify as vegetarians or vegans than consumers living in the Prairies or the Atlantic Region. Wealthier people also seem to commit more to specific diets. Consumers who earn more than $150,000 per year are twice as likely to consider themselves vegetarians or vegans than consumers earning less than $80,000. Nothing very surprising here, but younger consumers are really making things interesting. Consumers under 35 are three times more likely to consider themselves vegetarians or vegans than consumers who are 49 or older. Three times — that is a lot. Experts argue that the rise of speciality diets is due to consumers associating vegetarianism and veganism not just with animal welfare, as they did in the past, but also with healthier and cleaner products. Others are simply rejecting the model of industrialized agriculture altogether, but health appears more and more to be a factor. In fact, the poll suggests that over 12% of Canadians are diabetic, according to the survey. Consumers aged 49 and up are twice as likely to adopt a diabetic diet over time, than those under the age of 35. As our population gets older, it is difficult to see how that number could drop anytime soon. Questions concerning allergies also garnered interesting results. Almost 12% of Canadians mentioned having allergies, and over 20% of households with more than two children declared having to constantly watch for allergens. These are alarming results. For many years now, allergens have been a nightmare for food companies and the Canadian Food Inspection Agency alike. So far, in 2018, of the 35 food recalls issued by Federal regulators, almost a third of were due to the presence of ingredients undeclared on the label. Oddly though, consumers in the Prairies are two times more likely to suffer from food allergies than consumers in Quebec. Religious beliefs are also enticing Canadians to choose specialty products like halal or kosher foods, but results show these categories remain somewhat marginal. A total 2.3% of Canadians mentioned eating Halal foods regularly while less than 1% choose Kosher products. Supply remains an issue across the country, as Halal and Kosher foods are not always easily available. But with our ambitions around immigration, this could change. Obviously, this is just one survey which polled only 1,049 Canadians. As with any survey, results must be taken with a grain of salt, no pun intended. Still, these results point to a much more heterogeneous food demand than we have seen in recent years. No wonder Air Canada now offers 18 different special meal options for its international flights. Catering companies and restaurants also know very well that serving patrons is an art that is slowly becoming more about customizing servings than delivering a standardized meal. So, if you are one of those who have no specific dietary needs of any sort, you are still in the majority. But with a younger generation seeking more dietary nuances, this could change over the next decade or so. Sylvain Charlebois, Dean of the Faculty of Management, Professor in Food Distribution and Policy, Dalhousie University. Author of “Risk Intelligence and Benchmarking: The New World Order in Food”, published by Wiley-Blacwell (2017). By Sylvain Charlebois| 2018-03-13T22:51:40+00:00	March 13th, 2018|Op-ed|Comments Off on A meatless Canada? Not quite, yet.